Situated on the Northwest Pacific coast of Costa Rica, Tamarindo features crystal blue waters, stunning natural surroundings and perfect sunshine year-round. First and foremost a fishing village, this area in the northern regions of Guanacaste province is the area’s most well developed destination for tourists, featuring accommodations of all types for all budgets. The pristine beaches and ease of travel around the town make Tamarindo an ideal get away. Major tourist destinations in Costa Rica are connected by daily buses that travel to and from the largest city of San Jose. These buses are first come first served, so popular routes are often totally booked. Bus routes typically travel to and from San Jose only, making this large city a natural hub for getting to Tamarindo. Expect a bus trip from San Jose to Tamarindo to take at least 4-5 hours. Car rentals are available and the roads between Tamarindo and San Jose are paved and well marked. If you prefer to fly to Tamarindo, the international airport in Liberia, Guanacaste is just a 45 minute drive from the beach cities. 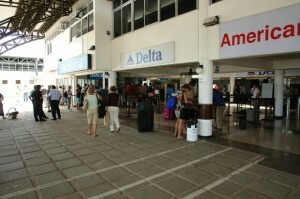 From San Jose, domestic flights are available to Tamarindo Domestic Airport. The main internal airlines that service the major tourist towns are Sansa and Nature Air. Be prepared to travel light, as these airlines have strict limits on their carry-on weights. The beaches at Tamarindo are located within a bay, formed by a cape called Cabo Velas (Sailfish Cape). Surrounded by breathtaking mountain views, the largest and most well known beaches are Tamarindo Beach, and inside the cape to the north lays Playa Grande. Between the two large beaches runs a natural salt water estuary called Estero Tamarindo. Situated to the south of Tamarindo Bay is another lovely estuary and across it, a large beach called Playa Langosta. All of these are within a short drive of each other and each offers pristine sand beaches perfect for enjoying the perfect Costa Rican weather year round. One of the most unique and incredible features of the beaches at Tamarindo Bay are the nesting giant Leatherback turtles. As they are inside the national park system of Costa Rica, both Playa Grande and Playa Langosta are protected as the largest major nesting areas worldwide for these, the largest of the sea turtles. Between the months of October and March, these remarkable creatures dig nests and bury their eggs in a clutch, which then hatch during the next full moon. As these turtles and their nests are protected wildlife, the best way to view them is by taking one of the official tours, led by naturists trained to locate and discuss the nests. In addition to the incredible spectacle of the Leatherback turtles, Tamarindo also offers the chance to hear and see other wildlife, such as Howler monkeys, which can be seen and heard swinging through the branches throughout Tamarindo. Wild giant Iguanas are abundant and often wander through crowded areas and beaches without so much as acknowledging their human neighbors. Parakeets are native to Costa Rica, and travel in flocks through the trees, and can be heard in the evenings as they squabble and talk amongst themselves. Visitors can take a jungle tour on small, shallow boats that move through the mangrove forests, where an incredible diversity of animals, including colorful tropical birds, rare anteaters and slow moving sloths. Tamarindo Bay is a favorite destination for surfers and sport fishermen. Fishing for giant tuna, sailfish, and marlin off the coast is a must for the blue water fishermen wishing to experience the best of Costa Rican fishing. A fleet of talented and ecologically minded captains are available for service. Deep blue water fishing, reef fishing, and shoreline fishing are all abundant. If you don’t wish to hire a boat for fishing, surf casting and hand lining right on the beaches for jack fish and snook can be another great way to fish the shores of Tamarindo. Many of the hotels and local beachfront restaurants offer the service of cooking your fresh catch for you. One of the biggest draws for sports enthusiasts to Costa Rica is the warm water surfing. Tamarindo’s year round perfect waves makes this area and favorite among beginners and life-long surfers alike. The waves that grace this part of the Pacific coast are among the easiest to learn to surf, as they are consistent and predictable. Many movies and surf reels have been filmed on the coast of Tamarindo Bay. Visitors to Tamarindo beaches can also enjoy snorkeling, scuba diving, water skiing, jet skis, kayaking (both river and ocean tours available), horseback riding, wind surfing, catamarans, and beach cruises that travel around the entire area with many short stops along the way. A wide array of rentals are available, as well as lessons, tours and instruction. Renting bicycles is a favorite among visiting tourists, especially families. Golfers have access to two championship courses in Tamarindo Bay, Paradisus Conchal and Hacienda Pinilla, both boast world class design. The climate in Tamarindo is near perfect, offering only two seasons: dry and rainy. From November through April, visitors enjoy the dry season, which is hot and sunny daily. The humidity is low and temperatures are quite comfortable. The rainy season begins in late April and continues through October. Most days during the rainy season are sunny or only partly cloudy until later in the afternoon or early evening, when showers form and move offshore. These clouds and rain produce spectacular sunsets, especially along the coast. During this time of year, the landscape is green and lush. Temperatures average between 80 to 100 degrees Fahrenheit year round in Tamarindo. Tamarindo could certainly the called the perfect Costa Rican beach town. With the perfect weather year round for enjoy sun, sand, surf and many other activities for visitors. With sport class fishing, sailing, golfing and touring available, there is something for even the most avid sportsman. Ideal for honeymooners, destination weddings, families and eco-tourists, Tamarindo Bay is a multi-cultural community sure to have something to offer every tourist looking for a beach adventure.